Little work is necessary on your part when a hamster has a litter of pups. The hardest parts may be keeping your hands out of her nest, neglecting your frequent cage-cleaning regimen, and refraining from touching the pups until they are at least 10 days old. Besides that, your work entails ensuring the mother hamster has a clean cage and soft bed before delivery and plenty of nutritious food and fresh water after giving birth. Clean the mother's cage about two weeks after she mates. Replace soiled wood shavings/litter with fresh supplies. A hamster's gestation period is about 15 days, and you want to ensure the mother hamster has a clean cage when she delivers her babies. Remove the wheel and other toys when you clean the cage to prevent the mother hamster from accidentally injuring the hamster pups if she should make use of the toys after the babies are born. Consider changing the water bottle. You want to avoid the hamster pups getting wet, and you need to ensure the water bottle is low enough that the babies can reach it for drinking by the time they are a few days old. Provide pieces of toilet paper in the enclosure. The mother hamster will use this to build a soft nest for her babies. Provide lots of extra foods for mom. Include treats that will provide her with added nutrition necessary for giving birth and nursing. These include carrots, cheese, greens, nuts and hard-boiled eggs. Check the cage a couple times a day to ensure an ample food and water supply. Scatter foods along the floor cage after the pups are about a week old. The mother hamster will carry food back to the nest for the babies, and the babies will begin to explore and get their own food. Clean the cage only after the pups have opened their eyes, around 2 weeks old. ⚠ It's important that you not touch the mother hamster or clean her cage for the first couple weeks after the babies are born. Place her cage in a quiet area where there is little activity as soon as you realize she's pregnant, so the expecting hamster can settle. If a mother hamster feels threatened, she will cannibalize her babies. Some mother hamsters will do so regardless of your best efforts; don't be surprised if it occurs. 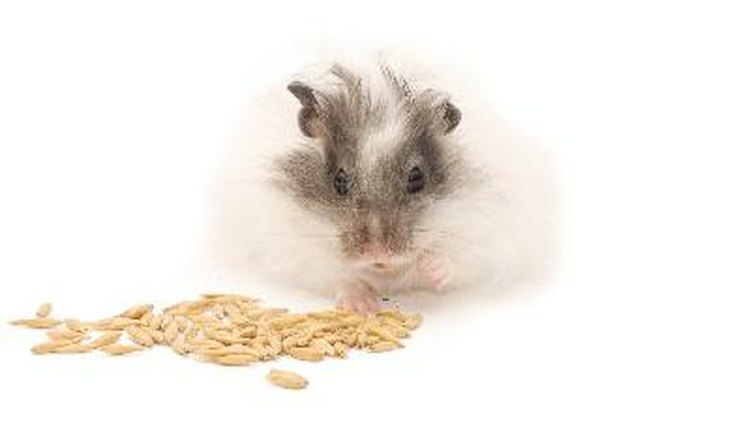 Many times mother hamsters who give birth to larger litters will cannibalize the weakest babies.